As a result, health advisers are warning about the dangers of the high temperatures. The level 2 warning, issued by the Met Office on Monday, said there is an 80 per cent chance of heatwave conditions over the next few days. Temperatures have already hit the high 20s in many parts of Britain – and it’s set to get hotter this week. 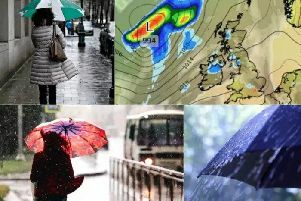 Met Office forecaster Aidan McGivern said Wednesday would bring scorching weather across the UK, with the hottest temperatures in the west of the country. “It’s another scorcher up and down the country, unbroken sunshine for the majority and hot again,” said McGivern. “The south east and the east coast in general starting off Wednesday with a little cloud and maybe some fresher temperatures,” said McGivern. “Plenty of sunshine across England and Wales, but some of this patchy low cloud and mistiness has made its way in overnight. “It doesn’t take long through Wednesday morning though for that to evaporate inland. Urging people to take precautions, Met Office forecaster Mark Foster said: “High pressure is going to dominate this week so we can expect very high levels of pollen and UV. “If you are in the sun you have a greater chance of getting burnt in the short term.” “Long days, very still conditions and clear skies help June temperatures to get very intense.